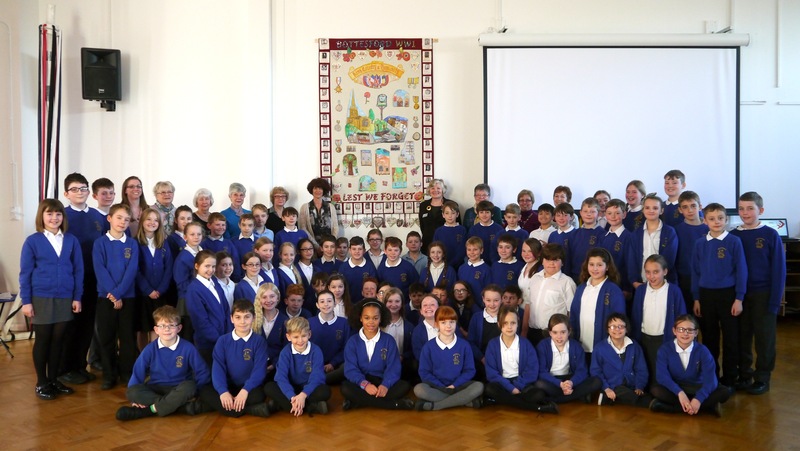 On Thursday the 11th February 2016 the pupils, staff and community volunteers gathered with eager anticipation at Bottesford Primary School to see the unveiling of their recently completed 1st World War Commemorative Banner. As they assembled the school orchestra accompanied children singing a peace poem. David Middleton, the Bottesford Parish WW1 Centenary Project Coordinator thanked all those involved (pupils, staff, community volunteers) and the Heritage Lottery Fund for their support. He then read from a letter written home by a former Bottesford School pupil Charles Pacey who was killed in the war. Charles described how easy it is forget all those ‘pals’ and ‘comrades who have gone’. The unveiled banner was truly impressive. The Headteacher, Mrs. McGrory, captured the spirit of the moment as she turned to the school – “Wow! Can we all go Wow! – that is superb!” Heather Broughton from the Heritage Lottery Fund congratulated the school and community volunteers for their success in commemorating the local heritage of service and sacrifice in the 1st World War. 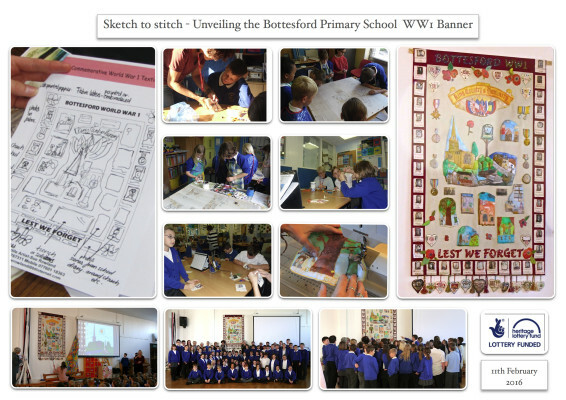 Sue Rowland, the textile artist and creative director explained how the children’s paintings and embroidery commemorated the fallen and celebrated the home front war effort of Bottesford School. Finally, on behalf of the School, Rachel Moore, KS2 teacher, thanked everybody for all their hard work. The creation of the banner dovetailed with the 1st World War Activities Day held at the School last September. Inspired by participation in that day KS2 pupils produced drawings depicting life within the community during the 1st World War and how the school contributed to the war effort. The children then worked with Sue Rowland, a Textile Artist, in transferring their work onto silk fabric in preparation for final assembly by Sue. Volunteer Stitchers from the Bottesford Parish WW1 Centenary Project and the Vale of Belvoir U3A Sewing Crafts Group also assisted the pupils with embroidering the names of all the casualties from Bottesford and Muston. Many of those involved commented that the time spent doing the art and craftwork brought them close to the people and events of 100 years ago. The banner will be on permanent display in the recently enlarged assembly hall at Bottesford Primary School. Events will be organised to enable the community to appreciate its contribution to the local heritage of the 1st World War. The generous support of the Heritage Lottery Fund is gratefully acknowledged. We have been reinforced just recently. it’s a pity how a man is soon forgotten though. & now just an occasional thought reminds us. Your banner is much more than an occasional thought. It’s a permanent reminder of how the School helped in the war effort. Charles would have understood and appreciated the importance of the banner for remembering his school pals and village friends killed in the 1st World War. So a big thank you to everyone for your enthusiasm and inspiring art and craft work: to Ms. Moore (KS2 Teacher) for organizing all your work on the banner, to the volunteer community stitchers who worked at home and alongside you in school, and to Sue Rowland for her creative ideas and skills in bringing it all together. A brilliant job by everybody. So give yourselves and the Heritage Lottery Fund a big round of applause! This page was added on 16/02/2016.